Every time there’s a mass shooting–like the one just a few miles from my New to Las Vegas home in October that claimed 58 lives, or the Valentine Day incident last month in a Parkland, Fla., school that killed 17–a national debate breaks out over gun rights and the Second Amendment to the U.S. Constitution. The powerful National Rifle Association claims folks have a largely unfettered right under that amendment to pack heat. Majority public opinion seems to be something else, but most politicians up to and including President Trump are too afraid of the NRA’s campaign contribution money to do anything substantive. So allow me to throw another log onto this fire. As I read our country’s history, people who defend the Second Amendment are actually defending a provision attached to the U.S. Constitution that was worded to make it easier for Southern states to preserve slavery. That’s right, slavery. The “well-regulated militia” phrase so famously found in the amendment, just before the equally famous “right of the people to keep and bear arms,” was a reference to officially organized whites-only posses in the South created for the purpose of keeping in line black slaves, who in many places outnumbered the whites. Southern politicians were afraid of the nascent Federal Government, soon to be dominated by Northern anti-slavery interests. They specifically were worried southern states would be prohibited by federal authorities from continuing to have militias that could rummage through slave quarters without warrants and, I suppose, shoot black folks who got out of line. For background, I am relying on several sources and a certain amount of supposition. By far the most accessible material on this subject is a lengthy 1998 article by law professor Carl T. Bogus (yep, that’s his real last name) in the University of California, Davis, Law Review, entitled, “The Hidden History of the Second Amendment.” You can download a copy by clicking here. For a law review article, it’s pretty readable by non-lawyers. 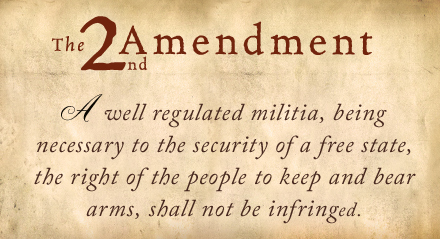 As drafted in Philadelphia and sent to individual states for ratification in 1787, the Constitution contained no provision at all on the right to keep and bear arms. But it had plenty of provisions bearing on militias–state-created part-time armies–and slavery. Article 1 Section 8 gave Congress plenary power to set rules for governing militias and calling them up. Article 2 Section 1 put the President of the U.S. in charge of militias when in federal service. There actually wasn’t much authority given to the states beyond the right to choose militia officers and train its members according to federal standards. The word “slave” or “slavery” deliberately did not appear in the Constitution. But assorted provisions permitted the practice. Article 1 Section 9 allowed the slave kidnapping trade from Africa (benignly called “importation of such persons as any of the states now existing shall think proper to admit”) to continue for at least another 20 years. The Federal Government could collect a tax on each new slave of up to $10 a head ($245 in today’s dollars). Article 4 Section 2 prohibited Northern states from freeing an escaped slave (called a “person held to service or labor in one state”) while requiring return of such a fugitive to the slave’s owner. Article 1 Section 2 allowed Southern states to count 60% of slaves (euphemistically styled “other persons”) when determining representation in the House of Representatives, giving those state more seats–although, of course, those slaves couldn’t vote. All these provisions were part of a compromise among the 13 states to get approval of the draft Constitution by nine, the minimum needed for ratification. But the ratification process was stalled at eight–not every state wanted to chuck the weak-central-government Articles of Confederation, under which the country had been operating since 1781–when Virginia chose 173 delegates who gathered in Richmond in 1788 to deliberate and vote. Patrick Henry–the slave-owning ex-governor best known now for his stirring pre-Revolutionary War battle cry, “Give me liberty or give me death!”–warned the assembly that the proposed Constitution gave Congress all the real authority over militias. George Mason, another prominent delegate who owned slaves (but said he was against slavery), said the feds could order the Virginia militia into a far-away state and leave Virginia unprotected. Even worse, Mason said, the feds could order the disarming of the Virginia militia. Mason had refused to sign the draft Constitution. Professor Bogus argued that this was all coded language for a fear that Virginia could be left defenseless against slave uprisings. Against this backdrop, Henry became even blunter by suggesting that the Federal Government under its power to provide for the general defense could enlist slaves in a federal army and then emancipate them. “May they (the federal government) not pronounce all slaves free, and will they not be warranted by that power?” he asked. James Madison, a Virginian and future U.S. President who was the principal author of the Constitution, a delegate to the Richmond Convention and, yes, a slave-owner, too, defended his work by saying Virginia certainly would have “concurrent” authority to arm a militia if the feds didn’t. But if Virginia ratified the Constitution, he agreed to propose amendments to the future Congress. With that proviso, the Richmond Convention narrowly ratified the Constitution 89-79, and it soon took effect. The Richmond delegates formally suggested a long “Declaration of Rights” for the new constitution, including one holding “that the people have a right to keep and bear arms.” Such language was not revolutionary; the English Declaration of Rights of 1689 contained a similar provision. But a bill of rights Virginia had adopted in 1776 did not contain that wording. However, in the context of the looming Constitution and the perceived need to preserve slavery, it became an imperative. In 1789, Madison was elected to the U.S. House of Representatives in the First Congress (defeating James Monroe, another future U.S. President), and resolved to make good on his promises to his fellow Richmond Convention delegates. In pertinent part he initially proposed this language as a constitutional amendment, “The right of the people to keep and bear arms shall not be infringed; a well armed, and well regulated militia being the best security of a free country.” The wording seemed to meet Patrick Henry’s concerns about free whites being defenseless against agitated black slaves. There isn’t a lot of legislative history explaining the rationale behind the wording changes, especially how “free country” became “free state,” although that, too, might be evidence of that Southern state slave revolt fear. Overall, Professor Bogus said the final version squared with the spirit that allowed anti-slavery Northern states and pro-slavery Southern states to agree on a governing document that tolerated the odious practice. “In effect,” he wrote, “Madison proposed that the slavery compromise be supplemented by another constitutional provision prohibiting Congress from emasculation the South’s primary instrument of slave control, and Congress acceded to that request.” The Second Amendment took effect in 1791. Now, the post-Civil War ratification of the 13th Amendment in 1865 ending slavery (except as a punishment for crime, the main reason convicted prisoners today can be forced to make license plates) served in effect to repeal a number of other slavery-linked constitutional provisions. These included the fugitive slave clause in Article 4 and the slaves-count-as-three-fifths provision for Congressional representation in Article 1. So if the Second Amendment was intended to support slavery, how about someone arguing in an appropriate court case that it, too, was repealed sub silentio by the 13th Amendment, and no longer in force? That’s yet another log on the fire from me. Leaving aside the obvious question of whether supporting the Constitution itself is “supporting slavery” (I know, 13th Amendment and Civil War fixed that, but still…) you focus only on Southern support for militias. Hamilton, a New Yorker, also wrote in the Federalist Papers that a militia is “the most natural defense of a free country.” England had a strong history of both opposing standing armies and protecting the rights of (some male citizens) to bear arms, and those traditions were not transmitted solely to the southern colonies. I’d call this highly selective scholarship. It doesn’t appear to me that Northern politicians of the day were all that worried about federal control of militias or the lack of Constitutional language about a right to bear arms, but many in the South sure were.